Today we have guest post by the Science Communicator Guru Randy Olson, who wrote an excellent book “Don’t Be Such a Scientist: Talking Substance in an Age of Style ” and has a great blog as well, The Benshi. The original is here. It was very cool. Very, very cool. For the first time I got a little bit of a simple intuitive feel for what the basic climate pattern is for this century. 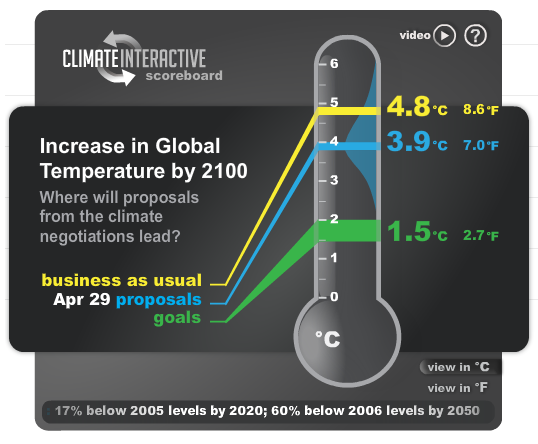 The overall game has three main data points with regard to climate, which are 0.75 °C — 1.35 °F — (how much temperature has risen since pre-industrial conditions), 2 °C — 3.6 °F — (what we can’t afford to go beyond) and 4.8 °C — 8.6 °F — (where we’re going to be in 2100 if nothing is done to change today’s patterns of emissions growth — what they call the “Business As Usual” or BAU projection).